Right now I have 2 big knitting projects in my tub (we won't mention the mass of sewing projects currently on the go - that's for another time). I'm working on a dress for Medium Stitch'd and a cardi for Little Stitch'd. Both were cast on within a few days of each other, and I'd hoped to have them finished by now. I also planned to start a Cardi for Big Stitch'd at the same time. . . . but I haven't. 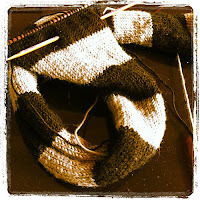 The cardi for Little Stitch'd should be finished. It's an easy knit - simple raglan sleeves, ribbing bands, stocking stitch. Shouldn't take too long, right? That's what I thought anyway. 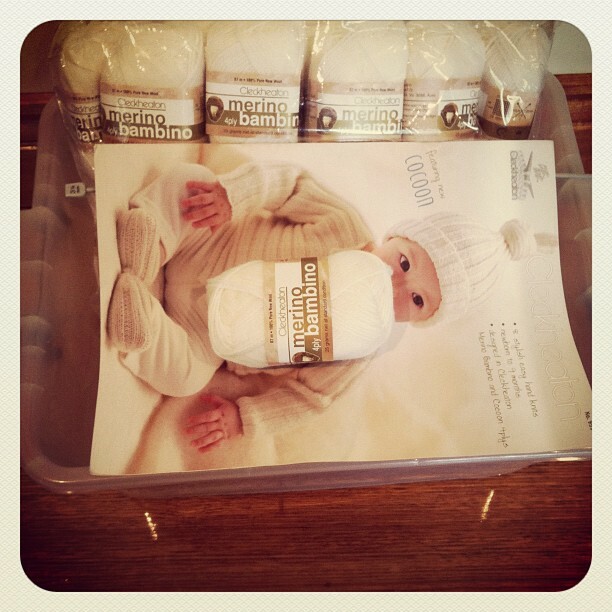 Cue the arrival of the yuckiest wool I have ever used, and plans have flown out the window. It splits all the time, and just feels yuck. It looks ok knitted up, but I really don't think it's going to be nice to wear. I'm not sure what to do with it. Do I continue working on it - he loves that I'm making it for him, and gets excited every time he sees it, or do I rip it out and try to find some nicer yarn? The dress for Medium Stitch'd is coming along quite nicely really. The yarn is gorgeous to work with, the pattern is easy to follow. The problem is the lace work - I keep making mistakes. 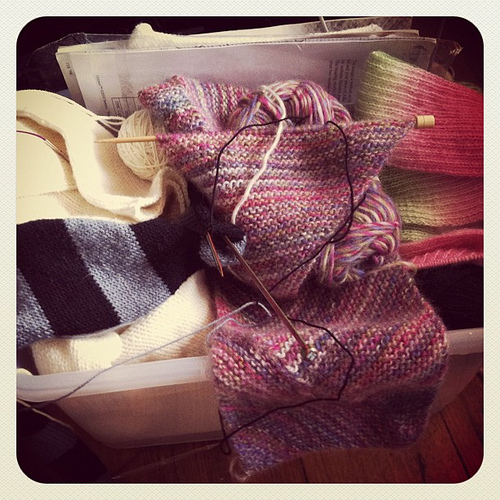 Getting distracted, forgetting to count, not passing the slipped stitch over. You name it, I've probably done it and all in the same section. After ripping out, reknitting and ripping out again the 4th repeat of the lace pattern 3 times I couldn't look at it again. After languishing in the tub for over a week, not being touched for fear of making yet another mistake, I picked it up again last night. 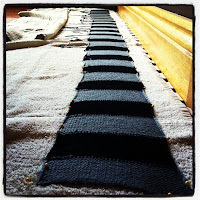 Got started and raced through the first eight rows of the pattern - no mistakes, the break is paying off. . . . . until I hit row ten and realise that I made a mistake in the previous round - just one, but one is all it takes. By the time I headed off to bed at the conclusion of the 3rd stage of the Tour de France, the very same repeat had been ripped out and completed twice more. I should be happy about this - the pattern only calls for 4 repeats, and 4 is what I've done. I'm not making a top though - I decided to make it a dress, which means at least another 2 repeats of the lace pattern. 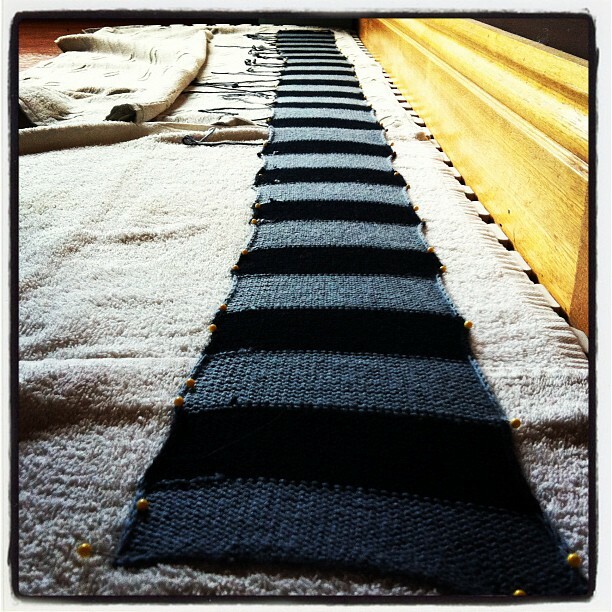 Just 2 more repeats, 28 rows in total.......can i get them done without mistakes this time? I'm starting to wonder about my crafting, and my love for creating things for my kids. Am I doing it out of need - or because it's something I love to do? I knitted my girls scarves for school. Within 24 hours of completion, both were worn to school and one was missing. The missing one was found, and to her credit Medium Stitch'd was extremely distressed about losing said scarf the first day she wore it. Fast forward 2 days and Big Stitch'd has lost hers as well. She in contrast to her sister doesn't seem to care. In fact, she didn't even notice it was missing until she went to put it on this morning, and once she realised, she wasn't bothered. It had turned up by the time we arrived at school this morning (a friend had found it and picked it up, knowing who it belonged to). This afternoon both girls had their scarves. Somewhere, between the school courtyard and home, one of them went missing again. Medium Stitch'd was adamant the remaining one was hers, Big Stitch'd insisted it was hers. Regardless one is here at home, the other is missing. Lost somewhere in the school carpark I suspect. To say I'm disappointed is not completely accurate. I'm not really sure how I feel, but it has left me wondering. Do I craft for my kids becuase they need it? Scarves are not a compulsory part of the school uniform but it does get cold, especially in the morning. Or, do I craft out of enjoyment and my children benefit from that? Either way, I'm left feeling a little disappointed this afternoon and wondering why I even bother, when they clearly don't care about the time or effort I put in for their benefit. Last year Mr Stitch'd asked me to knit him a scarf. I've mentioned it before and I didn't manage to get it finished then. It became the bane of my existance. Always staring at me from the WIP's tub, putting a dampener on everything else I worked on (or even considered working on). I took to taking it everywhere with me - working on it whenever I got a chance. In waiting rooms before appointments, in the car while waiting for school to finish. The problem was, 5 minutes here and 5 minutes there just wasn't cutting it. I wasn't get much at all done. We headed away for Easter, and it was the first thing I made sure I had - ready to take advantage of a 12 hour car trip. I will be honest and say that I actually managed to get a fair chunk of it done. But once we returned home it got thrown back into the WIPs tub and I tried to forget about it again. All those tiny stitches and that black wool . . . . . so hard to work with. Anzac Day dawned raining and miserable, and my first thought was "great day for knitting". In the afternoon the kids chose a movie and we all sat down together to watch. I pulled out the scarf, declared I wasn't stopping til it was done and I stuck to my word. It took all of the first movie, all of the second and even a bit more time while the kids were in the bath. But I got it done!!!!! I don't think I can express just how glad I am that it's done, or how glad Mr Stitch'd is that it's finished. After blocking it to try and reduce some of the tendancy to curl up (didn't really work), I sat down last night to weave in all the ends. Sadly there's no picture of the finished product, because Mr Stitch'd wore it to work this morning. Done, and just in time for winter too. life just gets in the way of our plans. I had this post all written up yesterday, ready to post after a few final tweaks and then Little Stitch'd got a hold of the computer and somehow managed to delete it for me - lesson learnt. Next time I won't leave a browser page minimised for little people to get at and make changes. I have no idea what I wrote, probably just some fluff about having plans to get lots of craft done once the girls were back at school. Instead I found myself feeling like a mouse on a wheel - constantly on the go, but getting absolutely nowhere. The planned craft has barely been touched, and I don't really have a new routine happening. Sad thing is that it's not first term anymore - it's the 3rd week of second term. I don't know where this year is going, but it's certainly flying. I have lost my craft mojo. I have nothing. No interest, no enthusiasm and no motivation. I have so many things on the go at the moment - and I have absolutely no interest in working on any of them. Not the things for me, nor the things that I'll be getting paid for. 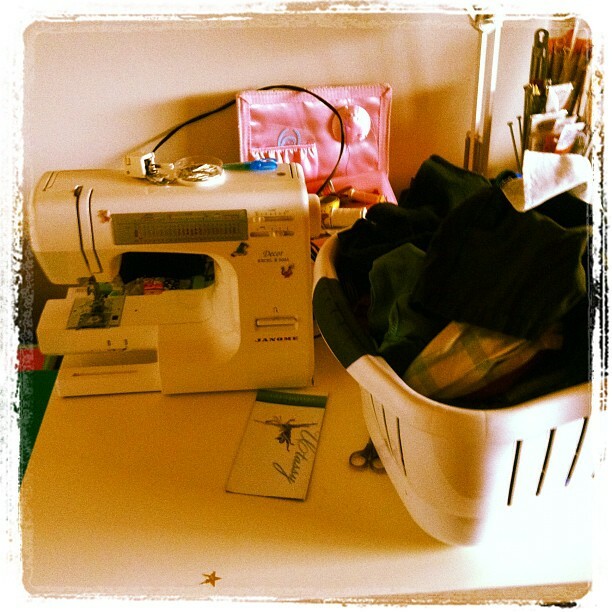 My sewing space has become a dumping ground - with my machine pushed off to the side. To be honest, the way I'm feeling at the moment, I'd rather it be shoved in a cupboard so that i wouldn't have to look at it and think of the things i need to get done. My WIP's tub has the same things in it that it had in it when i wrote about it here, nothing is much further along, and i'm still not enjoying any of it. How do i get my mojo back? Not starting anything new until the WIP's are done is not working for me - but i can't put them completely aside, because i don't think i'll touch them again. Little Stitch'd is finding it really hard being at home without his sisters. He's needing me to entertain him more and more. I think part of it is missing the girls and part of it is being a boy - he's so different to the girls. He requires so much more entertainment and so many more activities than the girls ever did. He's not content with much for long, and he has to be active. I'm starting to wonder if we need to rethink the decision not to enrol him in 3-year old kinder, I thought that 3 days a week of activities would be plenty, but now, I'm not so sure. To relieve the boredom today, we did some baking. He loves to help when I cook, so today we made a simple chocolate cake and I let him help a lot more than usual. It filled in some time, he loved it and to top it off we have something yummy for afternoon tea today. Combine all ingredients in a bowl in order listed, and mix for 4 minutes (best with an electric mixer - otherwise it'll be lumpy). Pour into a greased and lined tin - I use either a 23cm sqaure tin, or a 22cm round tin. Bake in a preheated oven at 180 degrees celcius for about an hour. We make the frosting as soon as we've put the cake in the oven. That way, by the time the cake is cooked and cooled the frosting is ready to use. Nothing worse than having a yummy cake sitting on the bench and no frosting ready for it. stir over heat, without boiling, until sugar dissolves. Gradually stir hot butter mixture into sifted icing sugar and cocoa. Cover; refrigerate until frosting thickens. Beat with wooden spoon until spreadable. The girls went back to school on Monday, and as usual I'm struggling to get back into routine. We don't have the problem of our children being used to sleep ins. Our 3 are early (by early I mean no later than 6am) risers. The problem is me, I can't seem to get my head around the dressed, fed and lunches made, by 8am routine that being back at school requires. I think Little Stitch'd is finding it hard too - he's really lost without his sisters, and my boy who is usually so happy to play for a little while on his own is following me around like a lost puppy, asking me to play with him constantly. I managed to get him to do something on his own yesterday, setting him up with some paint. Hopefully, that has been a start and he'll get a little better from here. In addition to struggling with the routine I have so much sewing that I need to get done - it's all sitting on my table, begging me to get to work. With the girls home it was just too difficult to do anything, and I was looking forward to this week and making a start. Little Stitch'd being unusually clingy hasn't helped, and if I'm honest I've been using him as an excuse to not do much. Even though I'd rather forget about it all and take my boy to the park again.